Think of your dissertation as an opportunity – an opportunity to demonstrate your expertise in Education, an opportunity to develop your own arguments, and an opportunity to pursue a topic that you’re passionate about. It’s a lot of work, but that’s a lot of opportunity! 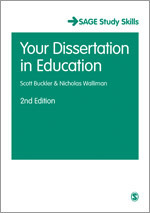 We’ve put together this page of tips, advice and resources to support you through the process of creating your Education dissertation. 1. Your supervisor is your oracle. Make sure you know exactly what is expected of you! 2. Once you’ve chosen a topic, it’s time to obtain background information. Read, research, and revise. 3. Arguably the hardest chapter you will write is the one on methodology – it will require the most dynamic learning. Clarify your philosophical stance. 4. Figure out your research methods. Interviews, questionnaires, and observations are all important tools that have varying uses. 5. Stress can be unforgiving. Manage it! Find out how you relax best and continue to do it – exercising is often a good way to clear the mind. Your dissertation needs to be written in a formal, academic style that doesn't come naturally to all of us. Use the videos and materials below to make sure you know how best to approach academic writing. Read this blog post by Alex Osmond, author of Academic Writing and Grammar for Students. In this post Alex discusses the challenges you might face when asserting your academic voice and expressing your views. Visit our Study Tube site for videos on subjects such as how to avoid common mistakes in academic writing, how to use evidence to support your claims, and how to find your voice as a writer. Music can be one of the best remedies for keeping motivated. We’ve picked 6 songs that will inspire you to power your way through your dissertation. Taking care of yourself under pressure will improve the quality of your work and allow you to emerge from the dissertation period with your mind and body intact. Visit our Pinterest Board for ideas on mindfulness, healthy eating, and de-stressing during this busy time. Hear it from someone in the know! We asked Jane, a student currently in the middle of writing a Masters dissertation on mentoring, to share the ‘best and worst’ aspects of the dissertation process. Here's what she had to say! What do you wish you knew before doing your dissertation? I must admit my university has given us lots of preparation so there haven't been many surprises so far. My dissertation is research based and I didn't realise how much planning it would involve! What is the best thing about doing your dissertation? The collegiality aspect. My colleagues are being wonderfully helpful and my research is really helping us to get to know each other better. I'm also finding out lots more about the international organisation where I work and this helps me understand better how we all work together as a whole. What is the worst thing about doing your dissertation? I feel very isolated from the university. I'm doing an online Masters and I now miss the online forums and I miss the contact with my peers.